I’m not gonna lie, chicks grow fast. I mean really, really fast. Basically, their only job this early in life is to eat and cheep (is that even a word?) and eat some more. So what do you do when your chicks outgrow their home? 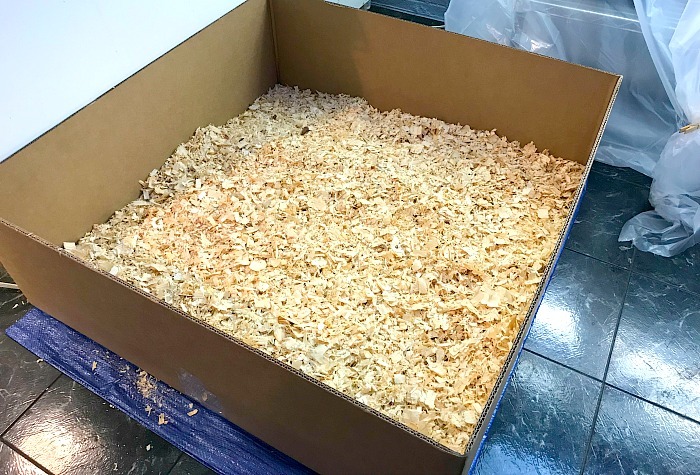 When I got my last batch of chicks I had them in a tote with a layer of wood shavings. I usually use a cardboard box, but wanted to try something new that particular year. It was a complete disaster and I no longer recommend using totes for chicks. READ: CURLY TOE IN CHICKS. WHAT IS IT AND HOW TO PREVENT IT. I quickly went back to the reliable cardboard box and relied on it yet again just this year with my newest batch of baby chicks. Hubs found a perfect box that was both large and shallow. It was easy to clean and held the chicks quite comfortably for the first few weeks. However, like I mentioned above chicks grow quickly and if you are not prepared or brand new to chicks this can catch you pretty much off guard. Just as soon as the weather warmed up a tad we prepared to move everyone out to the barn. We needed to find a safe and secure set up that we could use again and again. Before we dive into the new setup let’s review just how to house your baby chicks. When setting up chick housing, a few things to remember. Tip #1 Choose a container that has a non-slip surface. Your best option is a cardboard or wooden box with high sides to keep your chicks better contained. Tip #2 Put in a nice layer of bedding. I now put down newspaper then wood shavings. (do not use cedar) Please make sure you clean things out at least daily. 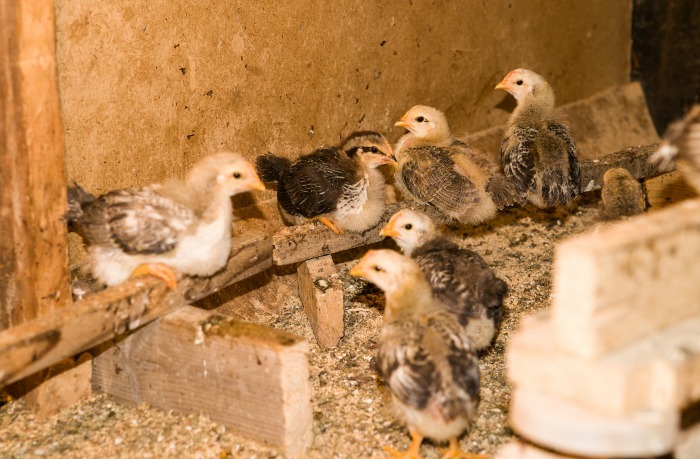 Dirty dusty homes can cause respiratory problems very quickly in a little chick. Tip #3 If the sides are lower, you will need to use a “lid” to keep the chicks from flying out. I have used window screens, chicken wire and a piece of wire shelving. Anything is fine as long as there is plenty of ventilation. Tip #4 Include a thermometer to regulate temperatures. You need to start with 95 degrees when the chicks are young. Decrease the temp by 5 degrees every few days beginning at 2 weeks. This will help them acclimate to the outside easier and better prepare them for the big move to the coop. Tip #5 Provide fresh water and food daily and up out of the bedding to keep things clean. I use a small piece of wood to raise things up just a bit. This just helps to keep the bedding out and the food and water cleaner. Tip #6 You can install a roost, but it is not necessary. Although it is quite entertaining to watch them play “king of the roost” on it! 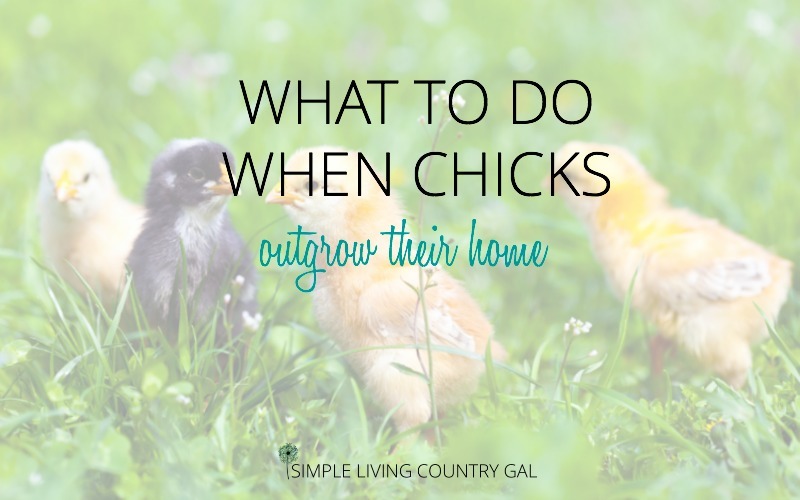 So, this is our checklist for new digs when chicks outgrow their home. It must not cost a fortune. We needed to make sure there were no gaps to the outside of the barn by placing pieces of plywood that we had on hand. Keep the chicks in and anything dangerous out. Chicken wire is used to cover all open areas. The top and the sides are all covered and secured with wire which was the only thing we purchased for this project. 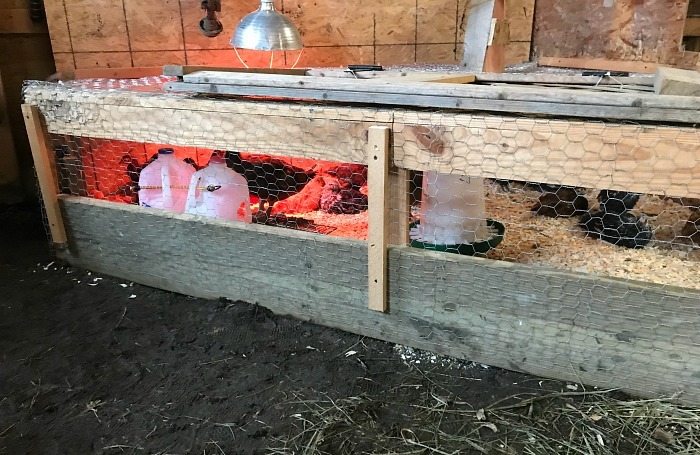 Has good airflow yet will keep the chicks warm until the weather improves. By having the walls exposed this ensured air could circulate and keep the air fresh so the chicks were not breathing stale air. This is one of the reasons why chicks and hens for that matter get sick. Poor air flow. Ample room to house them until they can be moved to the hen house. 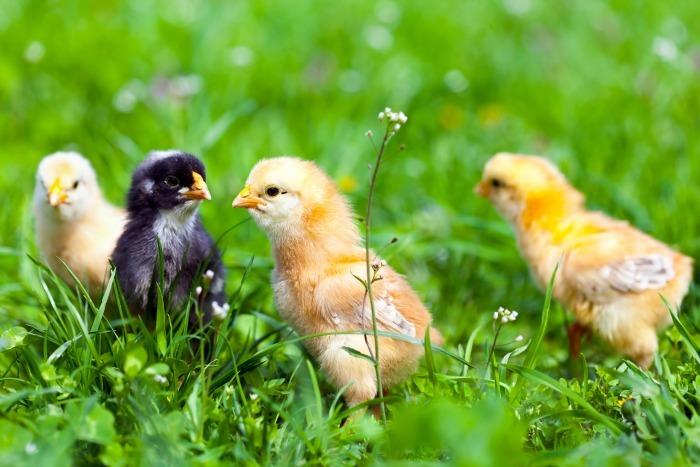 Baby chicks will need approximately 2 square feet each when they are very small but you will need to increase that as they grow. I would plan on about 3-4 square feet for their temporary housing. 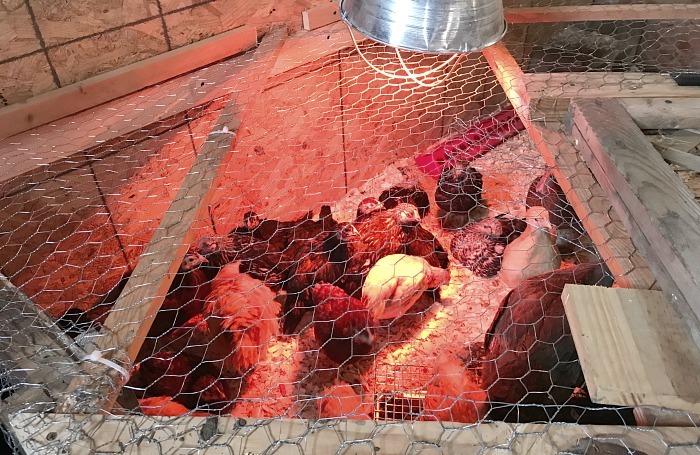 Grown chickens require 10 square feet if they are mainly kept inside the coop. If they are free ranging you will not need nearly as much room. Has a spot for food and water. You can purchase chicken waterers for this or simply make your own. 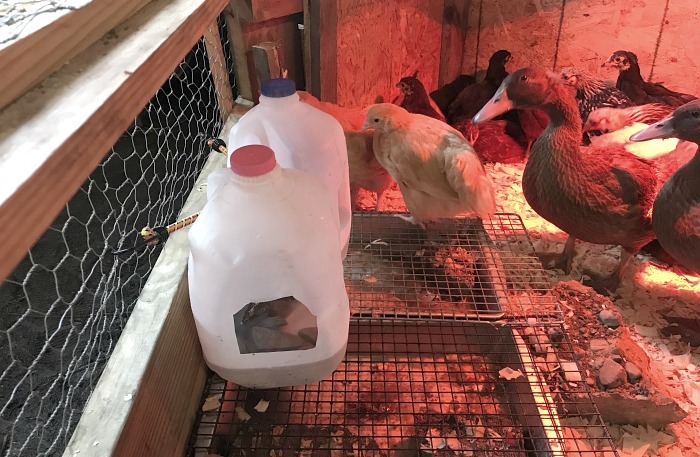 I buy my waterer’s for my baby chicks like this one and then use this one for my grown hens. For the temporary housing, I find these milk jugs work perfectly. Ninja tip: Place the water jugs on top of cookie racks that are on brownie tins. This really keeps the mess under control. You can also add a few clean rocks to the jugs to help keep the splashing down to a minimum. Is easy to get into so it can be cleaned. Like I mentioned above it is important to keep things clean so your chicks stay healthy. Heat lamps if used are done so safely. Make sure if the weather is cooler that you have a warm spot for your chicks. A heat lamp is a good way to do this but it is important to make sure you have a safe way to do so. We make sure our heat lamps are tied off not once but twice. Heat lamps are one of the top causes of barn fires so make sure yours is used safely. Has a door for the chickens to get out for those days when you want them to get some sun. Letting your chicks outside to play in the grass is a great way to get them used to the world and to you. Keep a close eye on your chicks so they are always safe. How long will your chicks be in this new housing? Until you are ready for them in the coop. Usually most chickens will begin laying their first eggs anywhere from 5-7 months old. It is best not to put them into a coop with older hens unless you have a smaller setup. We purchase new hens every other year. This ensure that we are always at peak egg production. Most hens will lay eggs consistantly for 3 years. Since we sell our eggs to offset our farm’s feed costs it is important that we always have a reliable steady supply. For that reason we are always bringing fresh young layers to replace our older hens. Check your chicks daily for any signs of distress or injury. As always our animals depend on us for the best care, so watching for any signs no matter how small will help you stop things before they get out of hand.